Neal Gittleman, music director of the Dayton Philharmonic Orchestra, will receive an honorary degree at Wright State's Spring Commencement. More than 2,800 students received their diplomas at Wright State University’s 2012 Spring Commencement. During the ceremony, one of the most prominent figures of Dayton’s artistic community received a very special diploma of his own. Wright State University awarded an Honorary Doctorate of Humane Letters to Neal Gittleman. 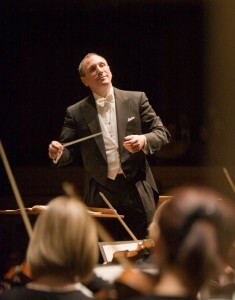 Gittleman has served as music director of the Dayton Philharmonic Orchestra (DPO) for 17 years. Each year, Wright State University considers the possibility of awarding honorary degrees to individuals whose contributions to society have been truly distinguished. Gittleman’s award recognizes him as one of the driving forces behind Dayton’s thriving arts scene. Gittleman does more than simply conduct the orchestra; he also has a passion for music education. He has devoted hundreds of hours to elementary school classrooms and special mini-concerts for children. He leads the DPO in several Young Peoples’ Concerts each year. 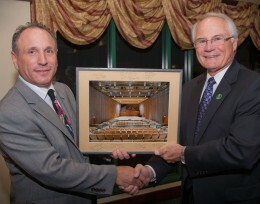 Wright State President David R. Hopkins presented Gittleman with a photo of the newly renovated Benjamin and Marian Schuster Hall at a luncheon in Gittleman's honor. Yet Gittleman’s educational outreach extends beyond youth programming. He also created the DPO’s Classical Connections series, which gives adult audiences a behind-the-scenes look at great works of the classical repertoire. “Under Neal’s leadership, the DPO has reached new levels of artistic achievement, and during his tenure the DPO has earned nine ASCAP awards for adventurous programming from the American Symphony Orchestra League,” said DeLon. Gittleman uses creativity to expand the orchestra’s offerings through innovative performances that reach new audiences and transcend the traditional concert format. For example, the DPO has performed the music of mainstream, contemporary artists such as Pink Floyd and Queen. Next season will feature concerts dedicated to the songs of Michael Jackson, The Doors, John Lennon and The Beach Boys. Gittleman has also helped create a series of affordable family concerts, such as the annual PhilharMonster Halloween show and a screening of The Wizard of Oz in which the orchestra performed the film’s soundtrack live. Gittleman has worked with the Wright State community a number of times. Most recently, he served as the music director for Bernstein’s MASS, a production that featured more than 100 Wright State students, faculty and staff members. So what sage wisdom does Gittleman plan to impart with his commencement ceremony address?